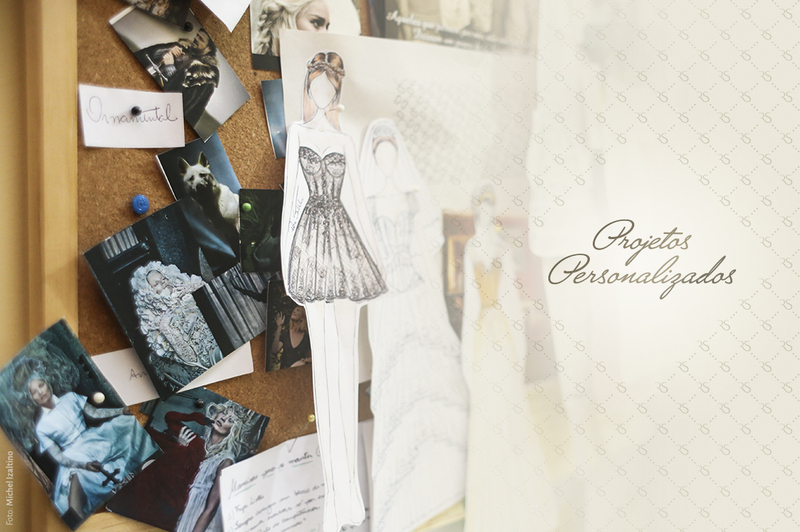 A breakthrough initiative in the national corsetry market, the Customized Development consists in the development of authoral and exclusive designs, signed by the fashion designer and corsetiere Rose Sathler. The project validates its exclusiveness as it is based not only on the client’s physical characteristics but also on her personality and individuality. Thus, the person who wears the piece add to it their private references. The client and her universe become an inspiration for the designer. All information collected by means of Briefing will serve as guidance for free creation. The project also takes into account the suitability to the occasion in which the pieces will be worn. For the Customized Development, the client’s availability must be essential. A great deal of information will be requested regarding her body measurements, and specific pictures are also essential for better analysis. Fittings may be requested during the process. Such fittings may take place in our atelier, located in Limeira, in the countryside of the state of São Paulo. The fashion designer is also available for carrying out the fittings in the place chosen by the client. In this case the client must be responsible for all costs referring to transfer, accomodation and fees. The Membership fee is of R$300,00, that must be paid at the moment of requesting the Customized Development. The total amount of the Membership Fee will be refunded through an automatic deduction in the purchase final value. Thus, the client won’t pay any additional amount for the pieces originated through the development of the Exclusive Project. The Membership offers rights over more than one sketch. However, it is relevant to highlight that all possible drawings will be part of a same study that corresponds to the production of one single look. The corresponding value will be charged for the development of two or more projects.